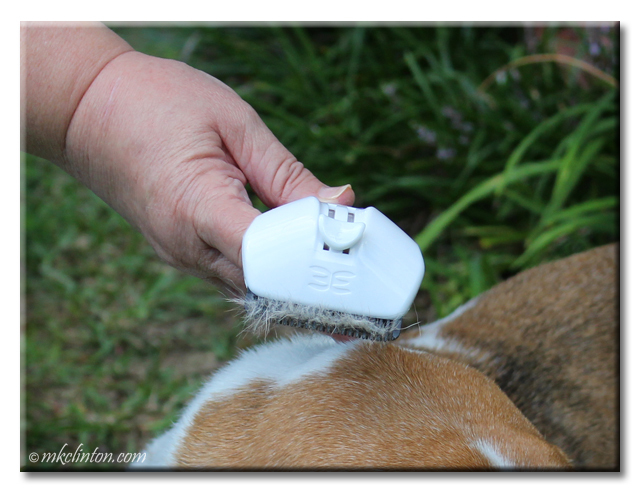 Barking from the Bayou, LLC received an Eazee Deshedding Tool in exchange for an honest review. Here at Barking from the Bayou, we have two completely different dogs. Pierre the Westie doesn’t shed very much and hates being brushed. 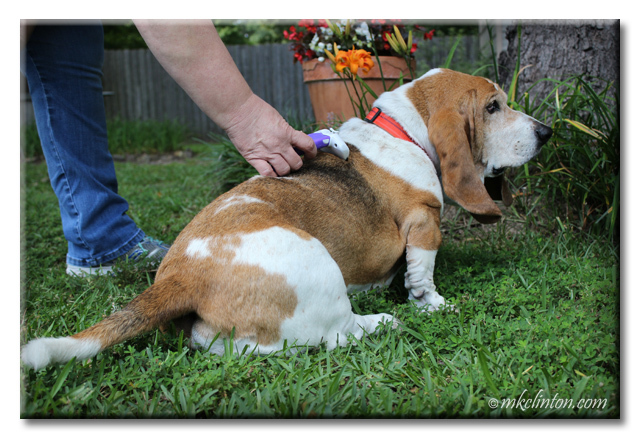 Bentley the Basset Hound sheds so much that we often wonder why he isn’t bald! The good thing is that he loves to be brushed. In the past, I have limited the amount of brushing for fear of harming his skin with the sharp metal teeth of my deshedding brushes. That is why I was so anxious to try the Eazee Deshedding Tool by Foolee. It has plastic teeth so it is much gentler to use. Enjoy this quick video to see how easy the Eazee truly is to use. The Eazee was invented by Eddy Cathaud who is known as a serial entrepreneur in France. He launched a chain of pet stores and heard many of his customers complain about the metal edged tools they used for deshedding. Those metal teeth can rip out healthy hair along with the dead and can irritate the skin. He knew there had to be a better way and the Eazee was born. It has two international patents covering the unique design. Grooming can be a wonderful way to bond with your pet as well as the best way to keep your home fur-free. Many metal grooming tools remove an abundance of hair but 30% of the hair they take off is actually live hair that’s been ripped out. 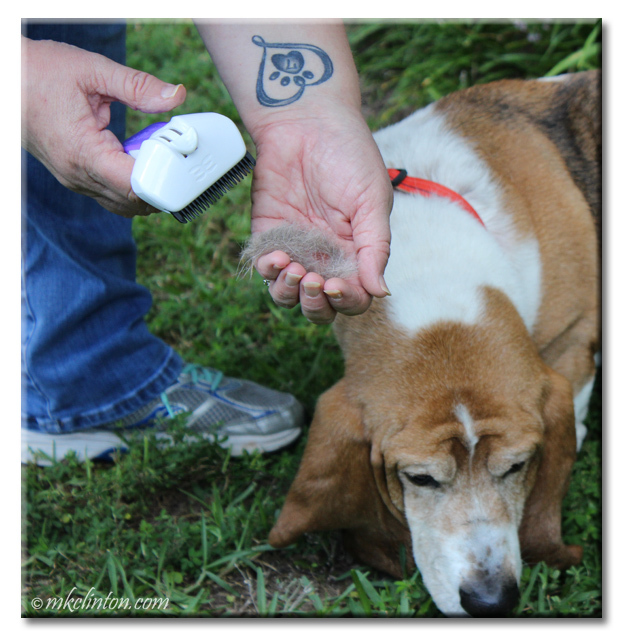 That can’t feel good to your dog or cat’s sensitive skin. 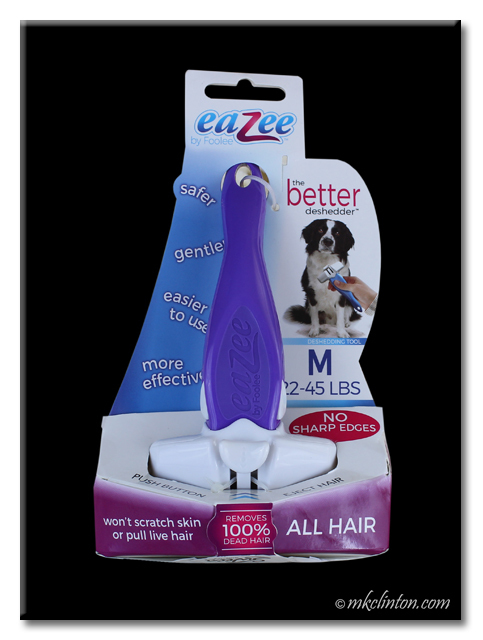 The plastic comb with its smooth, rounded teeth on the Eazee won’t scratch you or your best friend. You can choose from three sizes for your pup’s perfect fit. There are a number of different interchangeable brushing accessories available that all fit the same universal handle. You’re going to love how it fits in your hand! Speaking of handles, there are six vibrant colors so you’re sure to find one that suits your taste. The Eazee comes with a 100% money-back guarantee too. You can fetch this awesome deshedder at fine pet stores. Be sure to follow Eazee Deshedder on Facebook and Instagram. This sounds like an excellent product for long haired dogs! I could have used it on my old dog...Zippo had SO much hair! I love that it is adjustable for long or short hair. Momma says one of her bassets would blow his coat every spring and it would look like we skinned a whole family of rabbits in our backyard! Our German Shepherds blew their coat twice a year and our yard looked like there were fur tumbleweeds out there! LOL! I have a tool that looks something like this and mom uses it on me all the time. It works great! That looks like a good product. Chester has been shedding a lot lately. It is that time of year for sure! Wow, that's one pawsome tool! The Ranch fur-kids don't shed but I'm gonna pass along this handy dandy review to a friend whose dog sheds like crazy. I'd just been thinking about this kind of thing lately. Cricket has really been shedding a lot this spring and it takes so much brushing to get all the loose fur out. I worry about those sharp metal teeth as well. This brush sounds like it solves a lot of issues! I was always worried about irritating their skin. The groomer told me no to use the metal teeth on Pierre's coat because it would damage it. This plastic one is much safer. Ummmm mom wonders if that would work on a Kit-kat? I'm a SHEDDER too and I love to be brushed! In fact the brush is kept in a drawer of a table by the love seat. I often sit in front of the table giving mom my most intense stare! We depend on ours so that we aren't covered in fur! You would both enjoy this on your short hair. We wonder how this would work on thick, Persian fur. Mom Paula is always a little fearful of the one with metal teeth. Hmmmmmmmm....just ordered a de-shedder should be coming next week. I think yours looks better, will keep it in mind. Like you, scotties don't shed, but Roxy, don't know why she's not bald! I am using this instead of the metal teeth deshedder brush that I've been using. That sounds like a pawsome grooming tool. Although I wear a short coat I shed a lot too Bentley. However, we have just lived with it. My huMom will like this. Your huMom will be amazed at how well it works! We bet this would work really well on us cats, too. Thanks for telling us about it. Oh yeah, that reminded our mom she needs to do a bit of brushing over here ...!! We have a similar tool for cat bro Bert. We can't use that kind of a tool on our furs. Great job on your video Melissa, you made it so easy to see how the brush is used. I like the flexibility of this tool and the fact that it has plastic teeth that won't irritate dogs' skin. I can't believe Bentley sheds so much - he doesn't look like he sheds at all! Thanks for sharing.